It can be challenging. Pumpkin pie is traditionally packed with carbs, both in the form of pumpkin puree as well all the added sugar. We’ve got a great workaround for you! 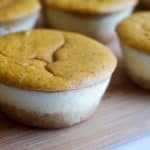 If you’re on a keto diet and you want to hit your annual pumpkin pie quota, try these Pumpkin Cheesecake Cupcakes! The reason they fit so well into your keto diet is because we’re cutting through the carb dense pumpkin pie with a thick layer of cheesecake. The remarkable thing about these is that the small amount of pumpkin in these really takes center stage. These pumpkin cheesecake cupcakes are the perfect replacement for your pumpkin pie this year. Plus, they look awesome and will be sure to garner you some compliments from the relatives! How Did You Make Them So Cute? This isn’t one of those recipes where you see the picture and you want to make it because it looks beautiful, and then when you get around to making it you end up with a sloppy mess that you’re forced to eat immediately so no one sees the disaster. These pumpkin cheesecake cupcakes are easy to replicate and make just as pretty as the pictures. The trick is the layering technique we used. First, you form the crust in the bottom and bake it so it is solidified. Then add in 2/3 of the cream cheese mixture on top of the crust. Then, we pumpkinify the remaining 1/3 of the cream cheese by mixing in the puree and pumpkin pie spice. Top these puppies of with the pumpkin cheesecake mixture and you’re all set. Don’t Eat All the Pumpkin Cheesecake Cupcakes Fresh Out of the Oven! If you do, you’re depriving yourself from enjoying them at their true pinnacle. Trust me, you’re going to want to pop these in the fridge for 2-3 hours and let them chill. After cooling down to a nice cheesecake temperature, these are ready. Dig in!